Sadly, almost all of my herbs got eaten by squirrels, killed by the heat wave, poisoned by black walnuts, or crushed by construction materials. This past week I decided that instead of harvesting my own, I’d order some lemon balm from the Lancaster Farm Fresh CSA and still have plenty of winter tea. 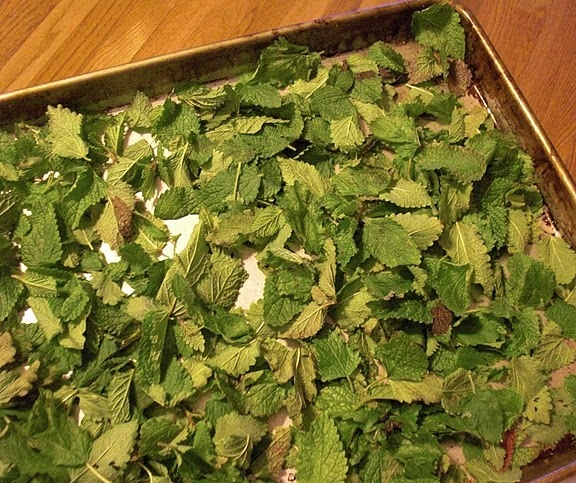 Lemon Balm can be dried like most herbs from your garden – easily. The fastest method is to lay the herbs on a cookie sheet and place them in your oven. Just a little heat – 100 degrees – can try the herbs in an hour or two, or if you have a gas oven with a pilot light you can leave them in there overnight and wake up to dried herbs in the morning. I usually remove leaves before drying, but with some tough leaves, like rosemary, it is easier to dry them on the stalk and then remove them later. 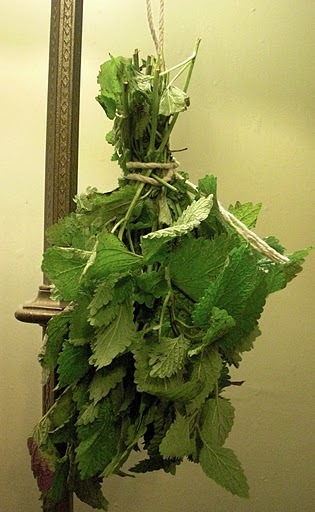 Some people prefer to hang their herbs by their stalks. These bunches, hanging over a kitchen sink, in front of a window, or in a dry attic look and smell lovely, though they can take a bit longer to dry. If left undisturbed, they may hang intact for months, but watch out – they can also get dusty! Previous Previous post: Brunch at Local 44 – Rueben for the win!